Portland Rose Festival Foundation officials gathered at Franklin High School before the announcement of the young woman who would become the "Princess" representing Franklin High School in this year's Rose Festival. The date was March 13, and the stage was set for the presentation. "We are so fortunate to have such a great pool of candidates this year! These are some of the most talented women we have in our community," Portland Rose Festival Foundation C.E.O. Jeff Curtis remarked to THE BEE. "This is, indeed, a scholarship competition, not a beauty pageant. When you look at the quality of the candidates, their academic history and commitment to the community – and their poise, who they are – this is truly about scholarship and their commitment to advancing their lives, and the lives of others." 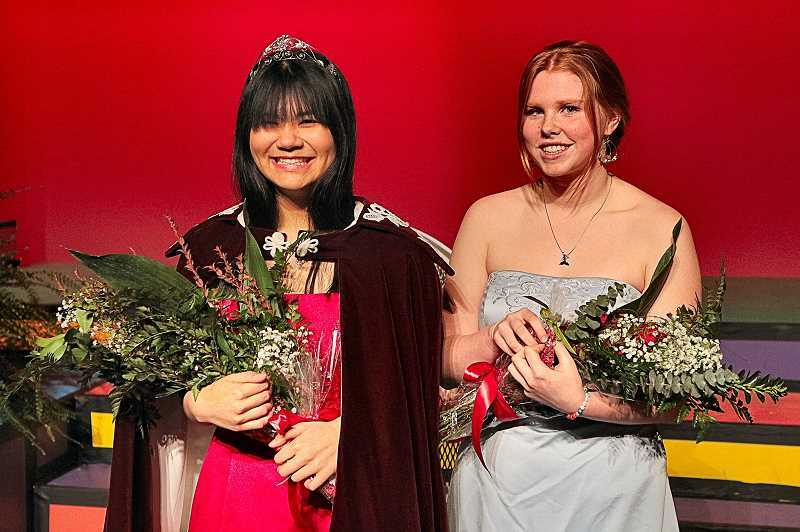 Franklin's Princess Court candidates Christina Liu and Wren Helzer-Florer were escorted to the stage. After introductions, FHS Principal Chris Frazier stepped forward to make the official announcement. 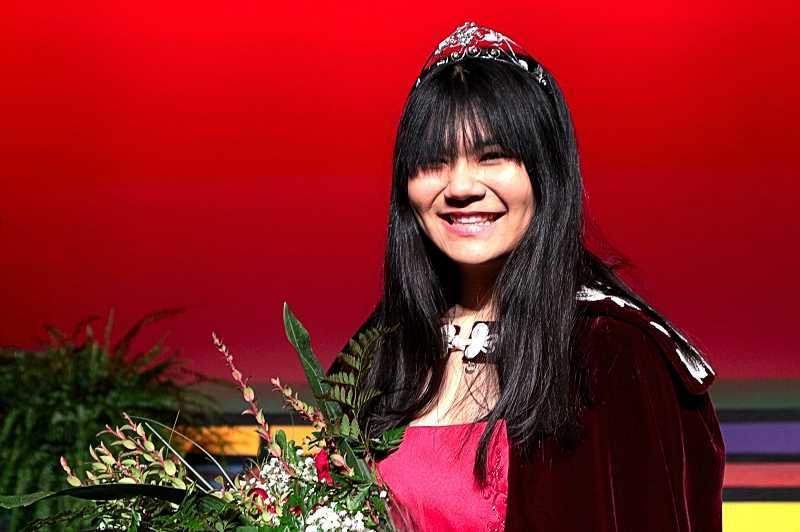 "It is my honor to announce the student who will represent Franklin High School as our Portland Rose Festival Princess: Please welcome and congratulate Christina Liu!" Last year's Franklin Portland Rose Festival Princess Amaya Gustave placed the tiara on the head of Princess Christina, while the Principal, and Vice Principal Scott Burns, wrapped a regal robe around her. Princess Christina attended Creston K-8 School before attending Franklin High, from which she'll be graduating in June. "I am super excited; I think this is an amazing opportunity for me to grow, and learn even more – and become a stronger member of my community," Princess Christina told THE BEE. "What I want to represent about Franklin High School is our community; everyone is inclusive, and willing to help each other out. I'm looking forward to growing my leadership skills – especially with public speaking, and meeting new people." In addition to her academic success and school activities, Princess Christina is also a Co-Chair of the Multnomah Youth Commission. As a QuestBridge Scholar and a recipient of the Harvard Book Award, Princess Christina plans to study engineering at Tufts University.